Ralph Goings (born 1928) is an American Photorealist painter whose pioneering work helped to establish the movement on the West Coast. 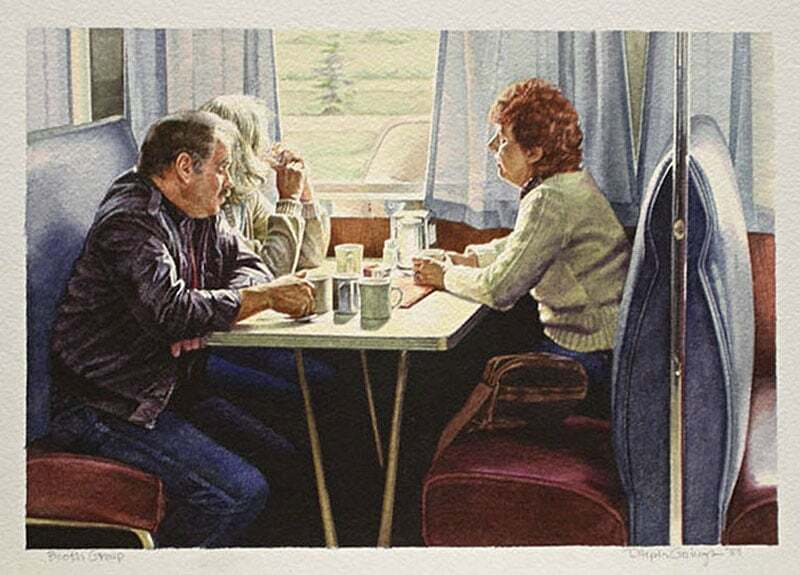 Goings’ carefully selected scenes—replete with detail—focus the viewer’s attention on the tactile qualities of diners, pickup trucks, and tabletop objects. His paintings reflect a rigorous attention to process applied to an everyday aesthetic. Goings’ interior scenes read as a vast landscape of meticulously rendered surfaces while his more intimate depictions of tabletops represent a poetic rendering of quotidian sensibilities. The uncanny reflections of light in Goings’ images suggest a slightly detached quality, as if caught in a moment of contemplative silence. Ralph Goings was born in Corning, California in 1928. He received his Bachelor’s of Arts from the California College of Arts in Oakland in 1953. 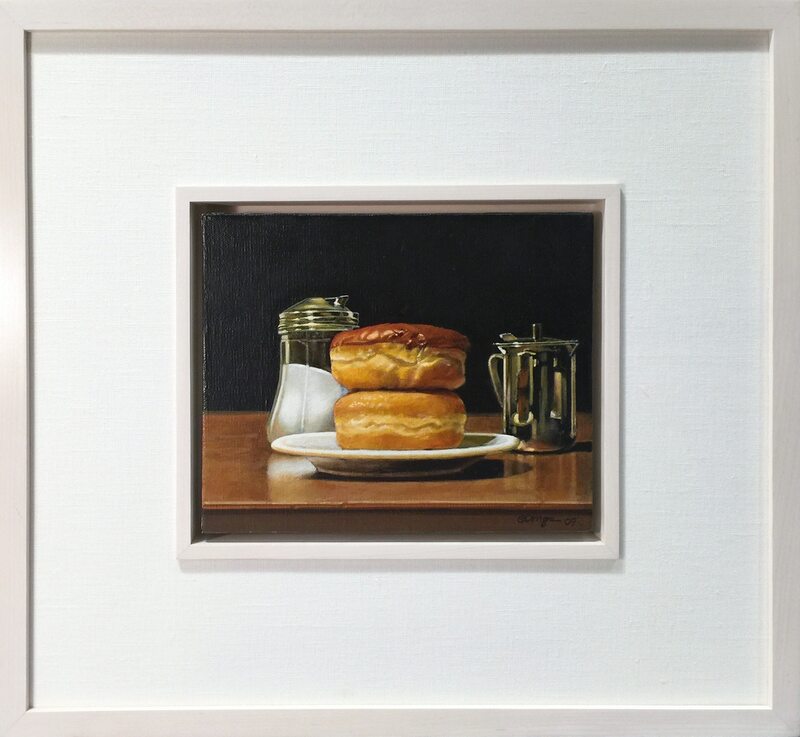 In 1966 he earned his master’s from California State University, Sacramento and soon began independently exploring his signature style of realism. Initially, Goings used images from magazines to inform his art. After culling thousands of images from magazines in search of the desired imagery, Goings decided to photograph his own source material. The photograph that is eventually translated into oil paint represents Goings’s masterful selection from hundreds of shots of parking lots, diners, fast food drive-ins, supermarkets, and coffee shops. After painstakingly selecting a single photograph, Goings works by projecting the image onto canvas and creating a detailed pencil composition. Goings eschews the traditional oil painting technique of layering colors to develop depth. Instead he dedicates himself to painting each object within the composition individually—often from left to right—approaching the image as a text. Goings references the photograph, but uses it merely as a source and never as a limitation. His works are interpretive and highly personalized. These works can take months of extreme concentration, yet the degree of finish in the final product renders the artist’s hand almost invisible. Goings’ move to New York State in 1974 focused his energies on depicting the interiors of diners. These intimate views of architecture and gleaming stainless steel stand in contrast to his earlier West Coast depictions of bright, exterior space. Goings resides in Charlotteville, New York and Santa Cruz, California.